After completing the final prostration in the last rak’ah (unit of prayer), whether that is the second, third or fourth rak'ah, you should begin the final tashahhud. The final tashahhud follows the exact same format as the middle tashahhud, except that it has extra parts at the end to finish the prayer. It is mentioned in various narrations that the Prophet Muhammad (may the peace and blessings of Allah be upon him) would sit differently in the second tashahhud, for those prayers in which there are two. 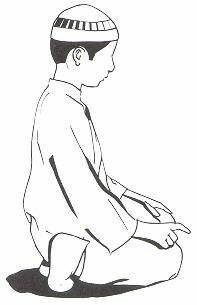 This sitting position is known in Arabic as tawarruk, and in this position, the upper left thigh is resting directly upon the ground, instead of resting upon the lower leg, and both feet protrude out of the right side. The left foot comes out from under the right thigh and shin, and the right foot is propped upright. In this position, the left hand leans heavily upon his left knee in this position. and from the evil affliction of the Antichrist.